Limited Tickets available for recipients of the Newsletter. After April 7th we will open up sales to the general public. Please contact Frank at franc49@comcast.net or 209-267-1003 if you would like to purchase tickets. 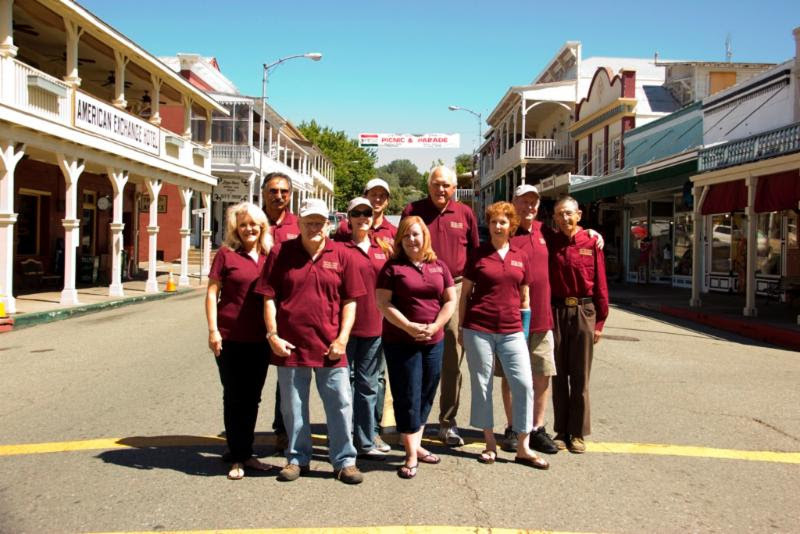 General Board Meetings are held the 3rd Thursday of each month at the Native Sons Hall in Sutter Creek at 7pm. Eureka Mine Artifacts:The Board was presented with the opportunity to keep a great artifact in Sutter Creek. 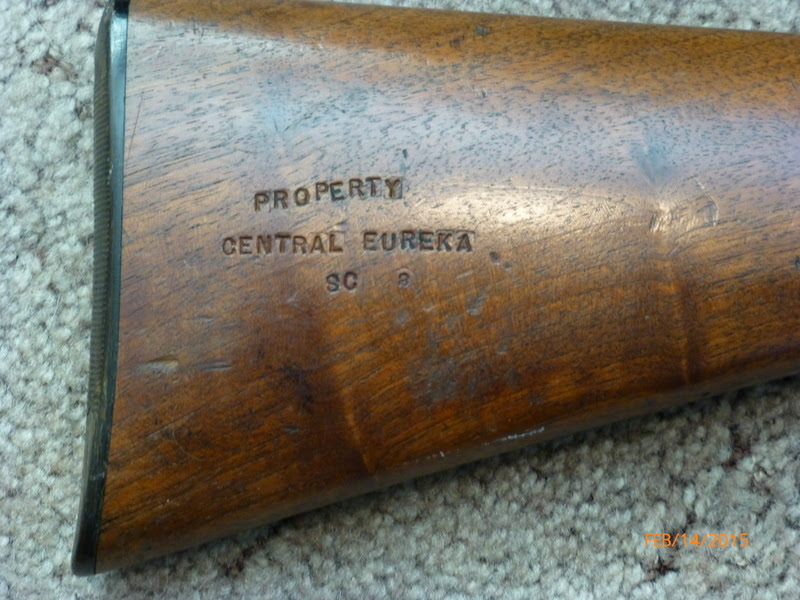 The Board approved the purchase of the shotgun and strong box originally from the Eureka Mine. 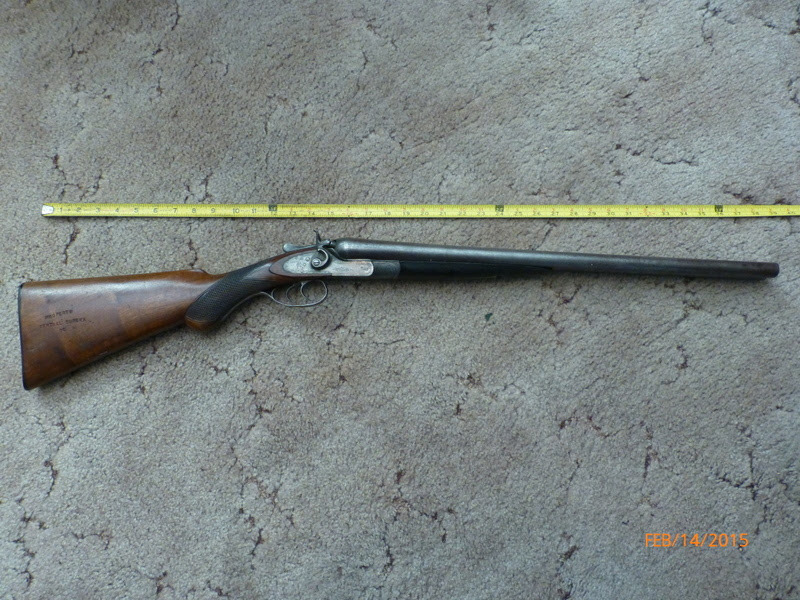 The shotgun and strongbox will eventually be on display at the future museum at the Sutter Creek Grammar School. The Sutter Creek Grammar School:We are just a few months away from the main downstairs room becoming available for public use again. The City of Sutter Creek has adopted standards for the use of the space. Recently the walls received new plaster and will soon be painted. We are now working on increasing the the water pressure for the downstairs bathroom. We suspect that over 100 years in galvanized pipe the interior diameter of the pipe may now be the size of the pin head. As you have likely seen while driving by the Park, the concrete wall separating the park from old 49 has been completed. We are now working on raising funds to cover the concrete with native rocks. The park will be graded next week to remove old asphalt and allow us to begin installation of walkways and landscaping. The first order of engraved bricks was placed and we anticipate that the commemorative brick walk way dedication will take place in May. Completion of the Park is on course for September of this year. The Sutter Creek Community Benefit Foundation invites you to participate in Sutter Creek's new Miners' Bend Historic Gold Mining Park by buying a personalized engraved brick in the Commemorative Pathway. 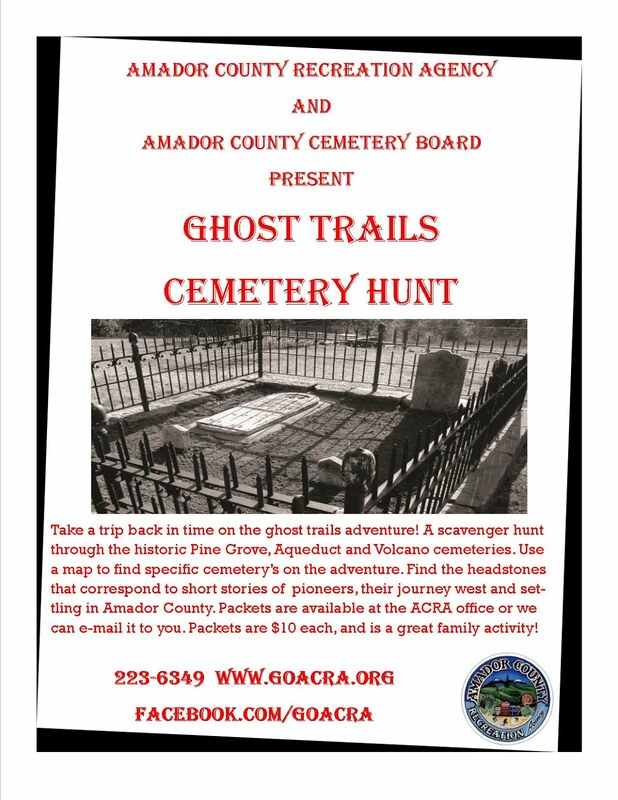 You and your family will not only provide financial support to the Foundation and help finish this park, but you will cement your place in Amador County's gold mining history forever. The work at Miners' Bend Park at the South end of Sutter Creek continues. By now you have probably noticed all the mining artifacts that have been placed at the South end of Main Street. Sutter Creek Community Benefit Foundation has been working hard to make this historical project a reality and now are building a brick walkway that you can be a part of. September of 2016. 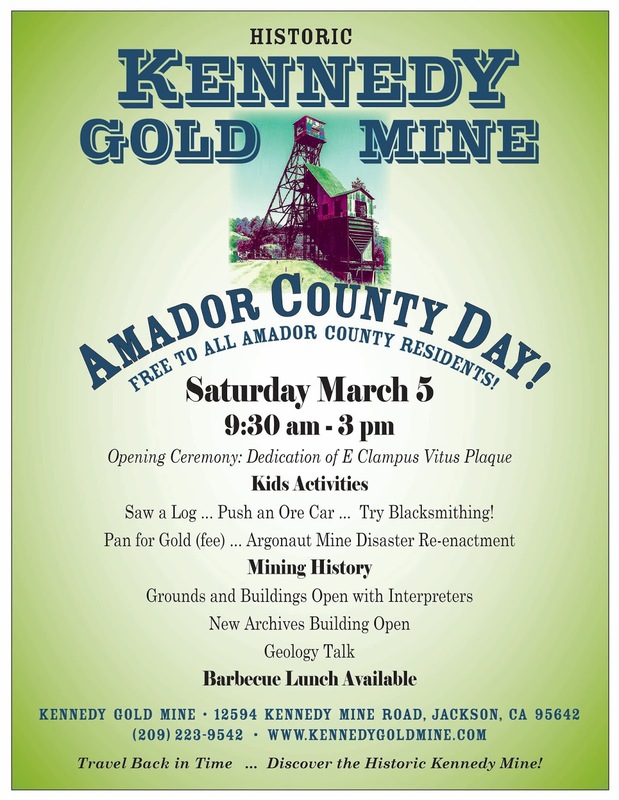 The Park will feature over a dozen displays telling the story of Amador's roll in the California Gold Rush. Work is being done on interpretive signage that will give visitors a brief history of the gold rush in Sutter Creek and Amador County, with historic photos and descriptions of each artifact on display. The SCCBF would like to thank all those who have donated time and money to help make this project a reality. The Donor Brick Campaign will help them complete the park. Purchasing a brick is the perfect way to commemorate loved ones, promote your business or organization, honor a special occasion, or find that special gift. Remember, your brick purchase is tax deductible. Buying a personalized brick helps the Sutter Creek Community Benefit Foundation preserve our cultural heritage in Amador County. To order, visit www.sccbf.org . For more information please call Frank Cunha at 209-304-9192. The park's centerpiece, a 5-Head Stamp Mill that was built at Sutter Creek's Knight Foundry in 1882 and donated by the Louis Boitano Family, is being rebuilt and installed at the park. A replica of a head frame with a winch, motor, mine shaft and an ore car, or skip as it was called, has been erected next to the park entrance. 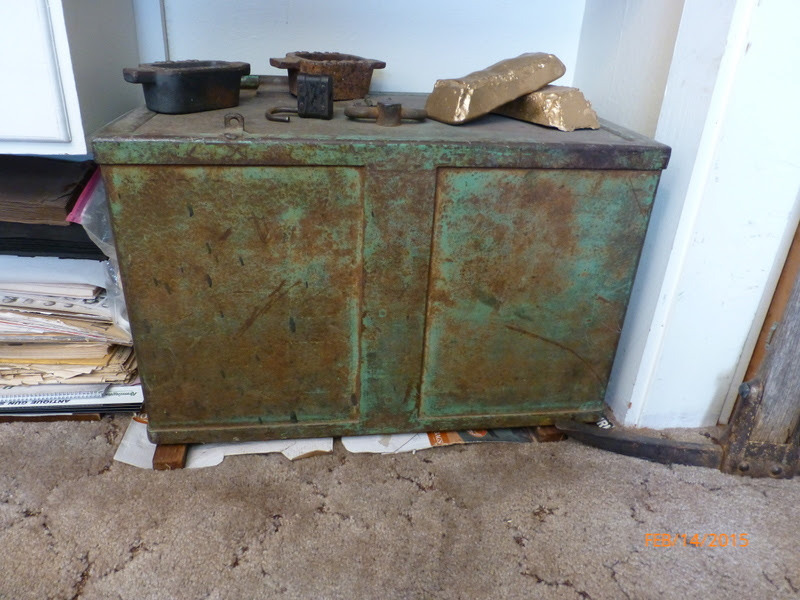 The Skip was donated by the descendants of the John (Jack) Tone Family and was used in his mine in the Rail Road Flat Mining District. Our home still stands, though muchly worn. Though memories I'll quote in this zig-zag way. Memories are flashing in leaps and bounds. With me, you'll agree, as you read my rounds. So you'll forgive, if I make a mess. Its waters gougy, smugy and a mucky brown. Though a foaming, snowy white, from the upper hills. With China Lantern in the dark of night. Spent all my money buying twine. How we would sling-shot them just to hear the thud! And out of mud, biscuits we'd make. And gathering mushrooms on the Butcher ridge. What blending colors gathered by rake. For old pots and kettles we scoured the town. How pigs squirmed, munching for swill. While poor sheep died without a murmur. On queery scales would weigh my bed-rock gold. What a pity, how we'd shoot them dead. Always built their nests on high. Doves that I shot with my twenty-two. How good they tasted in a Mulligan stew! Stewed - good as anything I can think. How surprised! I did it on the run. But poor rabbit had lumps; then I was sad. For that's how they grave-yarded poor city slicker. They now call him "hound-dog Jack". When Johnny Zaro hunted on the Truscott ranch. How we made him follow - we only shot blue jays. We found the hive of the honey-bee. And got them home without a mishap. We climbed like clowns and ate like pigs. For kids always remember those who are kind. By the collar he'd start us, - like shot from a gun. Who never missed a funeral to toll the bell. His song "Ham and e-bacon, ax-andle and e-ham". Going to bed - we would cower with fright. Frightened folks scurried to the hill top. Miners were blasting with dynamite. Anxiously waiting the "horribles" to appear. Houses would rattle and dishes would heave. Scaled fences, swam rivers, and got away cold. Forgive him; he gave us kids many a dollar. And - they say Tony trained on foot-juice wine. Would make you laugh - just by making a frown. Ate tripe dinners at his cabin-home. When called for milk, gave us cheeny-poueen. Would give us punks so we would not tease. Sure made you hungry to sit down and dine. In the old oaken bucket we dropped in the well. To join the feast and drink to the baby's name. With cow-bells and tin cans they's shivaree. If the groom was slow in delivering the "booze". They bombarded him with old boots and shoes. Deed and Baker, with guitar and violin. Yet alaman-left held you in a trance. We all knew kind-hearted blind Jim. Remember Alex Dallas could run like a deer. Followed Charley Booker all over the town. Facing Main Street, sitting on the veranda. Picture old lady Booker with a red bandana. Yet we called one "Lamb" and the other "Coyote". "Rence" on his chestnut brown surely was game. Just as easy as corralling a steer. You know "Sutter" had its cave men in my days. Chinchilla-coat Johnny, and handsome Bart was tall. But oh; how he collected selling "too-ree". Yet we all liked handsome acrobatic Dunbar. You'll find it hard what I'm trying to relate. The day they raised the flog on the schoolhouse dome. My pants were torn and had to stay at home. Without dear "Ida", what would the kiddies do? Oh my! With rawhide, how he would sting! God is kind, so there is some good in all. Pretty names, too numerous to tell. Poor teachers kept us after school - who was to blame? Would grab our marbles and away he'd run. We never would fight for they were ten. Funny how nick-names will cling till you die. Bare-footed, we'd go to Posts' swimming pool. We did no swimming; no one got hurt. Such mocking whistling you never heard. And we smoked the leaves of the sticky tar-vine. Sisters kept me busy mooching tea-lead. How times change when you look back! Recall the old wooden boot-jack. When I drove "roly-poly-general" to Ione. How could I forget - I was altar boy. Just like marching soldiers, each one in line. No one could be seen with a reddish gown. Some one hollered "I smell skunk". When the wind carried that putrid sulphide smoke. Just one happy family, including cousin Jack. Of most every nation we had a few. Waiting for the stage and "Post Office" never fail. What excitement! Though there never was any mail. Hoping to find a misplaced "C". Every evening when the sun went down, Alas! Still I can hear Trudgen coming late. When pumping water from the old town pump. What music! We thought it was grand. While the town cobbles fiddled his Arkansas tune. Goes pounding through my memory still. For they're fond memories of "A-Sutter-Creek-Boy".